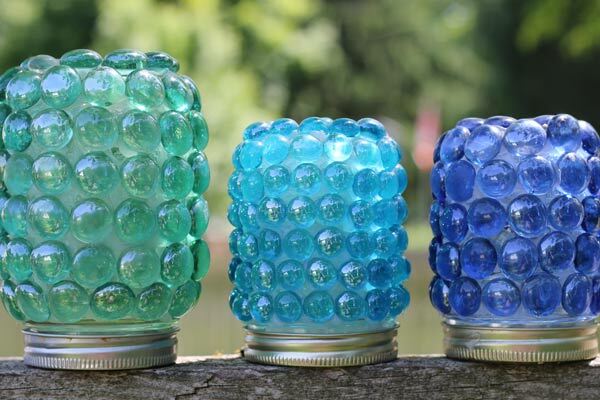 Turn old jars into magical garden treasure jars with this simple, frugal project. 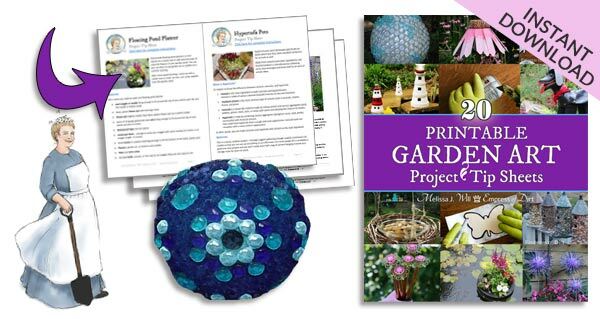 For more, also see these creative projects for the home and garden. 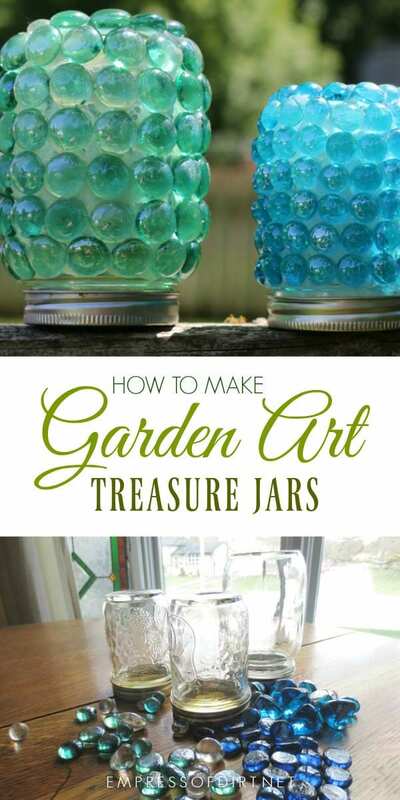 I started making these garden treasure jars when my kids were little and they wanted to make their own garden art. 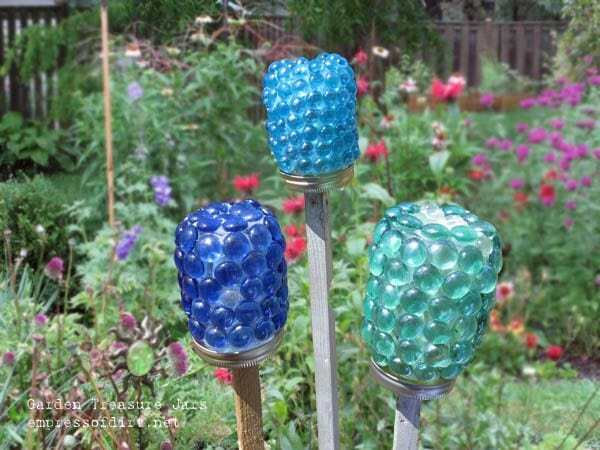 Made from used food jars, you can decorate them with glass gems (flat-bottom marbles)—or whatever you like—and place them in the garden. 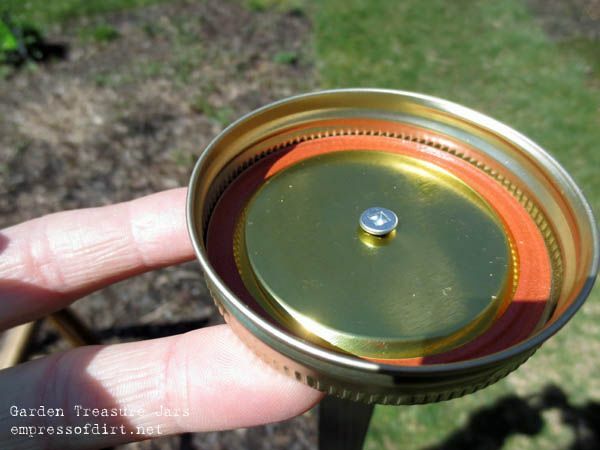 Tiny toys and secret notes can be hidden inside—like little time capsules in your garden. 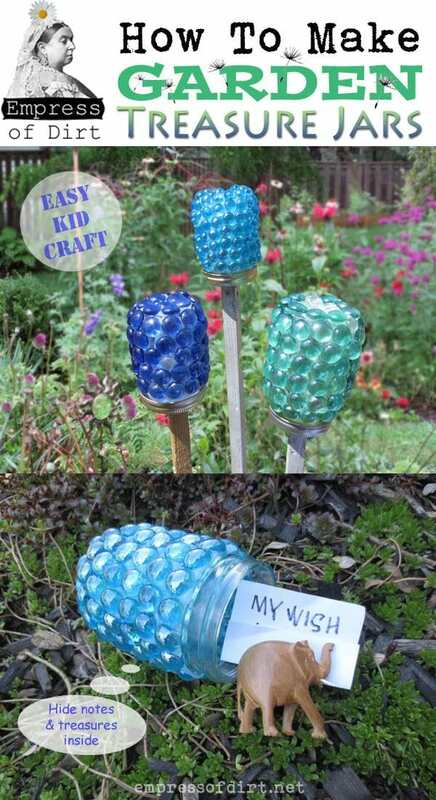 Glass garden art projects like this one look really beautiful outdoors with the sunlight shining through. You can also add little solar lights to have them glow in the evenings as well. The small size of the jars makes this a quick and easy craft for kids and adults. Be sure to read the instructions so you know the glue that really works! 1. Read over the instructions and material list and use your judgement whether this project would be suitable for your kids. 2. Have a adult handle the silicone sealant/adhesive – read the product label carefully and follow all manufacturer instructions for safety, application, and drying times. 3. I specifically recommend one brand of silicone sealant (to use as an adhesive) -listed below- because it works. If you substitute for another product, your glass gems may not stick to the jars or will fall off later. You might want to make a whole bunch of these at once. They would look fabulous lining a garden path or surrounding an outdoor patio. Pick a colour theme for the glass gems or mix it up like the colours in a flower garden. You could also use them as indoor or outdoor votive candle holders (use solar-powered votives) or a place to store small items. 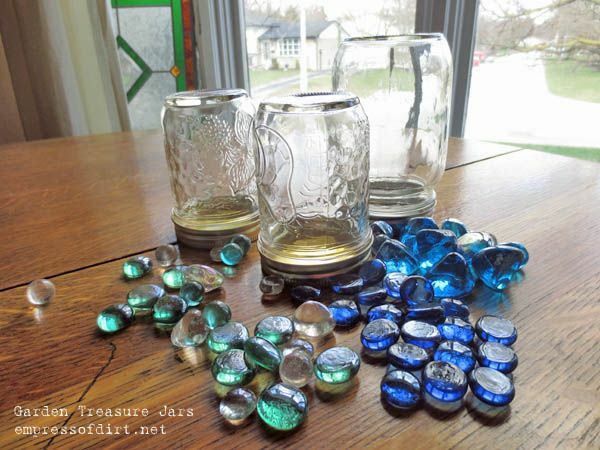 Used glass jars with lids. Flat-bottom marbles (see them at Amazon.com) Also called ‘glass gems’. 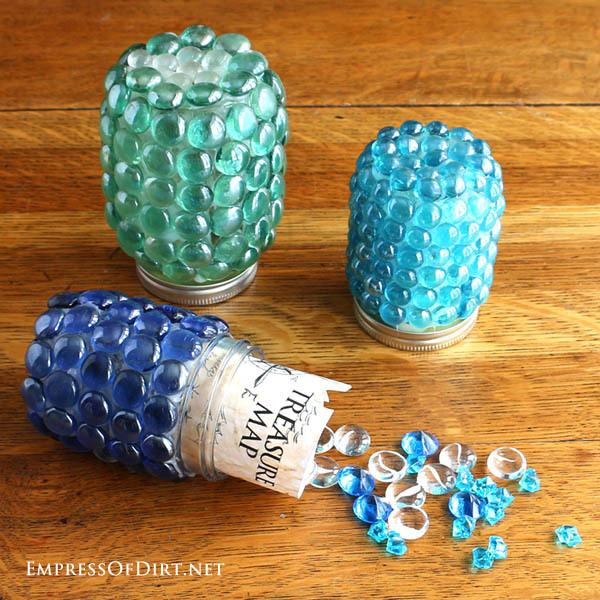 (You could also use small stones or decoupage the jars). 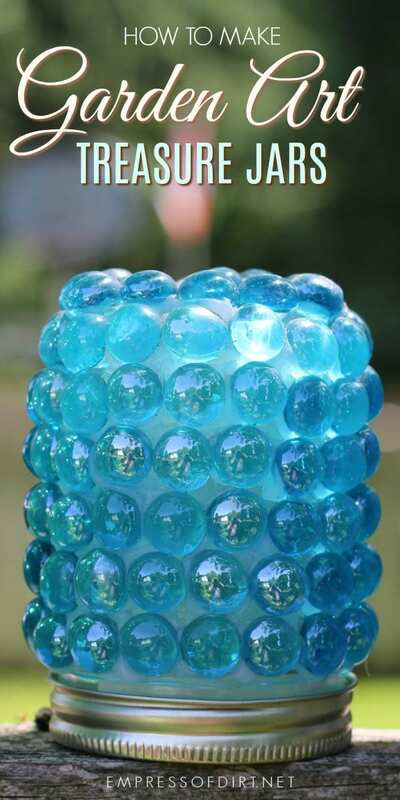 A 4″ tall jar needs approximately 75 ½” flat-bottom marbles. GE II Silicone Sealant (clear, waterproof-buy the stuff made for either gutters and flashing or windows and doors: It’s not a glue but instead grabs the marbles IF you apply it at least 1/4″ thick). If you are new to using silicone sealant as an adhesive, read these tips first. Wooden post or dowel and ¼” wood screw. or Copper pipe and end cap (see one at Amazon.com). TIP: There’s often a few smaller-sized marbles in each bag. Set these aside and use them to fill in any odd-size gaps as you work. Place the jar upside-down, so the lid/opening is on the table. Cover the sides of the jar with silicone sealant.I do the bottom of the jar last so I can put my fingers there to steady the jar while applying marbles to the sides. Sealant washes off hands with soap and water. 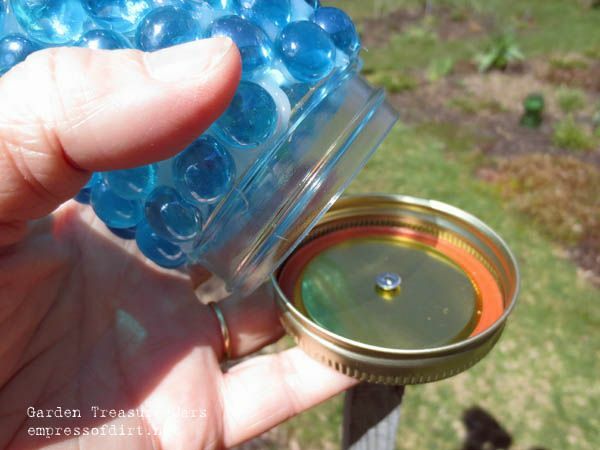 Attach flat-bottom marbles to the jar, working in circles from bottom to top, leaving room for the lid to open and close.It’s important to work from the bottom up so that the marbles rest on each other in rows: this way they won’t slide around while the silicone sealant is drying. 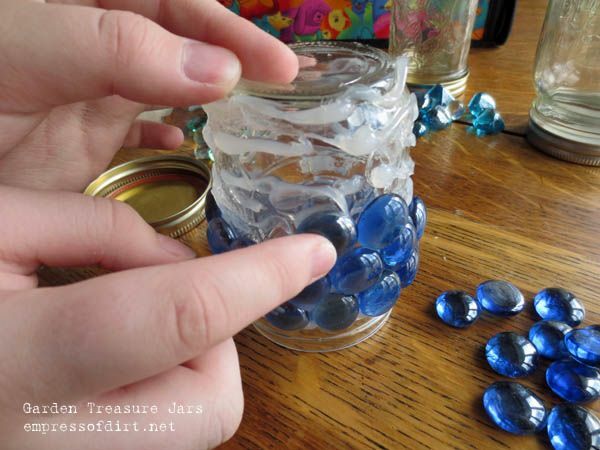 Last, cover the jar bottom with silicone sealant and attach the rest of the marbles. Punch a small hole in the jar lid. I used an awl and a hammer for this. Attach the lid to the top of the wood post with a wood screw. OR glue a copper pipe cap to the outside of the jar lid, allow to dry, and place on copper pipe. Be sure to hide a note and a treasure inside the jar. Attach the jar to the lid on the post. If your kids are rascals like mine, you might even find out later that the treasures have been switched out for something you weren’t expecting. And, if you want to light them up at night, add some solar-powered votives! Love the name and artful jars. Can’t wait to make some. Love these! Made some using acrylic “ice crystals” in a variety of colors then put a battery operated tea light on a timer inside. They turn on at dusk now, just like a solar light would but for a fraction of the cost. Wonderful addition to my garden, thanks! Really love this idea. Will for sure do this with my Grand kids. Great idea. I’m going to make these with 4th graders. Silicone sealant “not for children.” Is that for younger children? How about 10 year olds? Would the marine goop be better or worse for kids? Thanks. Hi Jennifer, I would urge you to read the warnings on the labels of any product before deciding whether you would consider it appropriate for use with children. It completely depends on your setup and the kids involved to know whether it would be ok. I don’t use any adhesive unless I can work outdoors (for the best possible ventilation). I personally would not be comfortable with most children handling it. Thank you. And now I’m trying to come up with a substitute because the jars are so darn cute and we’re going to have students place written invitations to pollinators in them to display in the school garden. I can’t give up the craft. Help! How do you remove the sealant from the outside of the jar. probably left by my hands as i was gluing the stones. Hi Carol, I don’t think you can remove sealant from select areas. That’s what makes it such a good outdoor glue: it doesn’t come off. I have seen others use hair dryers to heat an entire area (around a bathtub etc when renovating) and then pull the softened sealant off. 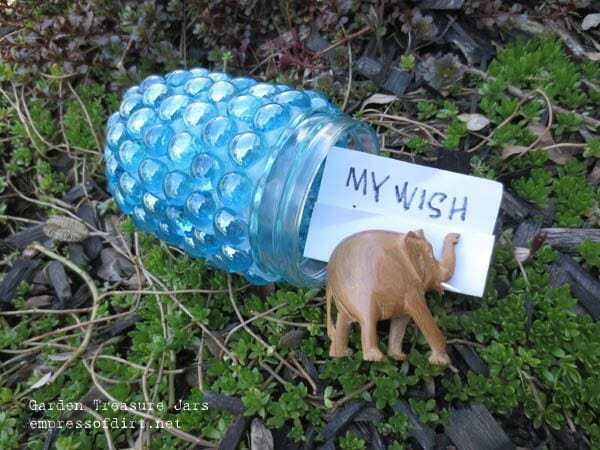 These glass jars would be super cool as a “prayer” capsule in your own garden or church garden. A “Give It To God” garden jar! Anyway, the hot glue works also. When I used the hot glue gun my glass stones all fell off the next day. Do you have any tricks to making it stay. I made 2 with the silicon but you see all the silicone. Don’t like the look a much. You can apply silicone one stone at a time, just applying it to the back of each one. It’s a slow process but it also won’t show. I love glass. these are going to be so cute in my garden. cant wait to make them. I use marine goop. Found with boating supplies at Walmart down the fishing isle. It is really great stuff. Waterproof and UV resistant also. I use it for everything and never had a problem. Hi Milly, I wash and dry the jar and then wipe it with a spray of rubbing alcohol, and wait until it evaporates, of course. For some people the big problem is natural oils from their hands, so not touching the jar is key. But, it’s no big deal – the adhesive is very good despite some grease or dirt. I made 3 jars today. Bought the GE 11 sealant at Home Depot, glass pieces and jars at Michaels. jars were $1.99 each. Also got the wood posts at Home Depot for 60 cents each. I will paint the posts a contracting color to the glass beads and spry the posts with a clear varnish to prevent weathering. The sealant does work just remember to use enough ad you can do 1 pr 2 rows and wait till it sets before adding more rows. Going to the dollar store to get solar lights. Think these will look awesome when completed and going o make my cousin a few for her garden. Thanks so much. I’m always looking for easy and cool projects to add interest in my garden.